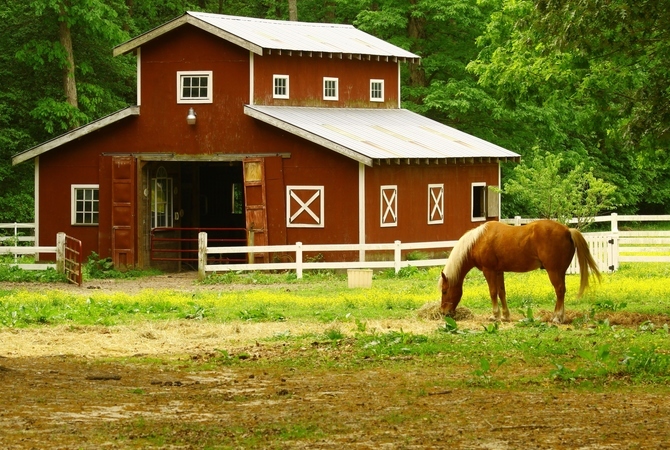 A horse grazing near a red barn with stalls, open doors and windows. Many factors need to be considered when it comes to housing your horse. Some people prefer to board their horse either at an established stable or on a local farm. Others prefer to have their horses on their property and to build barns for housing the animals, equipment and feed. The choice is often dictated by the circumstances of the horse owner. Obviously, having a property that is suitable (and legal) for horse housing is not always a choice. Time is also a big consideration. Feeding and cleaning stalls takes time that not every horse owner is willing to spend. Also, many peopled enjoy the camaraderie that they experience at "the barn." For these owners, stabling at a barn is preferred. Others enjoy the daily activity of taking care of their horse or horses. They like being able to casually visiting with their horses on the spur of the moment. There are other advantages to having your horse close by for routine riding and exercise activities. Estimates of costs to take care of a mature horse annually in a home setting run between $1,000 and $1200, with a minimum of $2400 annually if the horse is boarded in a stable. Boarding your horse at an established stable or on a local farm with other horses is an option that is convenient for many people, but is generally more expensive than keeping the horse on your property. Boarding your horse has the advantage of freeing you from most daily chores and management responsibilities, although many stables charge less if you are willing to clean stalls, provide feed or feed your own horse. If you board your horse, you don't have the pleasure of having your horse right outside your door and available at any time. In addition, you most likely will not spend as much time with the horse as you would if it were closer. On the other hand, an established stable may have access to good riding trails, an indoor arena, care and training services, riding lessons and other perks such as getting to know other people with horses at the facility. If you are modifying a current property or beginning from scratch and designing and constructing your personal horse facility, you have many choices to make, and, in fact, books have been written about the necessary considerations for designing and building your horse facility whether personal or large scale. What are my horse's needs? What do I intend to do with my horse? Basically, horses need shelter from uncomfortable weather conditions whether it be heat, cold, wind or snow and a safe, dry place to eat. For ages, horses have survived very well in most climates with relatively modest shelters. If your horse is strictly for pleasure riding during good weather, again, a modest shelter with space for exercise, some pasture access, and a dry place for feeding may meet the horse's needs. On the other hand, if your horse is to participate in shows, competitions or races, you will need to consider more protection from weather and a more elaborate facility along with more sophisticated trailer and travel considerations. Type of enclosed structures such as barns, stalls, etc. Most of the factors above come into play if you are boarding your horse either for the long term or on a short-term basis since you will want to know that your horse is safe and well-cared for. Fortunately, most areas have rules and regulations for horse-boarding facilities and you will be able to observe whether the boarding stable is well-planned, well-maintained, safe and clean, and horse and horse-owner friendly. If you are housing your horse at home or on your own property, consideration of these factors will help you establish the best possible facility for your horse whether you are modifying an existing property or starting from scratch in your backyard. The local weather conditions in your area will determine how elaborate your shelter for your horse needs to be. In a temperate climate, a three-sided shelter or a cold barn to provide protection from weather and wind and a dry place to feed the horse may be sufficient along with a dry storage area for hay, tack, and other necessary equipment. In colder climates or in cases of competition horses with demanding schedules, more elaborate structures including barns, stalls, arenas and exercise paddocks may be necessary. Cities, counties and states often have zoning regulations and building codes that determine the number of animals allowed on a particular property and where animals are allowed. Building codes may restrict the size and kinds of structures and where they can be built along with requirements for safety features related to electrical, plumbing, flooring and other considerations. Before making any decisions regarding either remodeling of existing structures of building of new facilities, check with you local planning and building departments for lists of requirements. The terrain and topography of any particular site must be considered in any plans. Barns need to be elevated above surrounding terrain for good drainage. Wind patterns and weather conditions will affect not only the location of structures, but also access and egress provisions and the best way to place the structure to take maximum advantage of sun light, etc. In addition, the materials for floors, walls, stalls and other parts of the facility need careful consideration and will depend on the climate, the particular horse, and what is available. Care should be taken to select materials that are easy on the horse, especially the horse's legs. For example, concrete and asphalt are sometimes used for stall floors, but can be hard on the horse's legs and hooves, as well as slippery when wet. Sand and soil have a tendency to develop holes and low spots, but are easier on the horse's legs. The size and location of stalls is an important consideration and should be determined with the horse's size and freedom of movement in mind. Consideration of existing or future pastures and paddocks need to be part of planning for maximum usefulness of any additions to the site along with the number of horses that will be using the facilities. Driveways and access for trailers and other equipment should be high on the priority list both for convenience and safety. Horses need to spend as much time as possible outside and have a large area for free exercise. Many types of fencing are available and the number and kind of horses, the size of the property, and over-all utility should be considered in determining the appropriate fencing to best meet the needs of you and your horse. For example, if your horse is into cribbing, you will want to consider fencing materials other than wood. Hay and bedding should be stored away from areas where horses are kept in stalls both for safety and health reasons, but easy access and transmittal to stalls and feeding areas should be considered. Choice of hay should be determined by what provides the best health and vitality for your horse. Choice of bedding usually depends on availability, price and suitability of the material. Bedding should be sufficient for most horses with three to four inches on a dirt floor, and up to eight inches on a concrete or asphalt floor. Bedding should be clean and dust-free and provisions should be made to change it frequently. Tack areas, utility areas, watering troughs, and utility spaces for tasks such as bathing and grooming your horse are an important consideration and should be given full consideration in any planning. Again, the temperament of the horse including the need for sociability is an important consideration. A few horses seem to be fairly contented in more or less isolated conditions, while others tend to develop stereotypies when left without the company of other horses and humans. If your horse is a show or competitive animal, your decisions regarding housing should include the special requirements necessary to allow for the exercise, grooming, and trailering of the horse. Effectively housing and managing a horse, takes a great deal of planning, time, and money. The more research and fact-finding you can do in preparation for owning and housing a horse, the better your chances for a healthy and happy experience for all concerned. A decrease in the hours of daylight is the main stimulus for a horse to lose its summer coat, and, conversely, increasing hours of daylight lead to loss of its winter coat. Some horse owners manipulate the loss of the winter coat by using fluorescent lighting to provide more light during the winter months. This can be important when it comes to showing animals early in the season when you want the coat to be sleek and shiny.